Web developers could always use a new tool to help with their process. In the world of the tech-savvy, our utensils of creativity come from multiple sources, but did you know you can use your smartphone as a Web development tool? BlackBerry has established several page builder apps that are user-friendly and affordable. The first thing any Web developer needs is a reliable FTP client. PaderSync allows users to sync their files through their mobile device. The program is comprehensive and offers virtually all of the features necessary to keep files updated between mobile devices and an FTP file server. It is available both for Android and Blackberry. The system requirements are a little high, but Blackberry has new cell phones on the market that can handle it with ease. There are also comprehensive help documents available for those that want to get started with the program quickly. 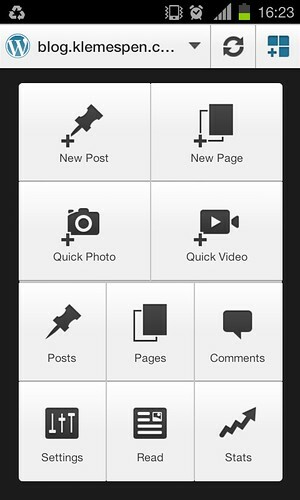 WordPress app image by Espen Klem via Flickr. WordPress has become a tremendous resource for many Web developers today. The WordPress application can easily connect developers to the WordPress-driven websites they maintain so they can quickly add content on the road. The WordPress application is very easy to use, but unfortunately does not allow for simple modification of code. Palettes is an application available for Blackberry and iPhone that allows Web designers to quickly create a palette of colors for a theme. Not only can Web designers create their own custom color sets but they can also quickly scroll through color sets that were designed by other developers. This can be a very quick and simple way for a developer to gain inspiration for a color scheme while they are otherwise stuck. A lite version of the application is also available for those that want to try before they buy. Web development isn't all about creativity — it's also about accounting. This app can be very convenient for developers who go to a lot of client meetings because it allows them to keep a constant eye on their time tracking and billing. WhatTheFont is a light and simple application that allows a developer to take a picture of text and get matches returned based on the font. This is an excellent solution for Web developers that have a fondness for typography and allows them to quickly identify font faces without having to play a desperate guessing game. Those that decide to use mobile phone applications for their Web development should remember a few of the cardinal rules of mobile phone processing. When doing important work on a phone a developer should always keep an eye on their battery life, and should save continuously lest they lose service at an inopportune moment. Joe Barrington - Joe is a mobile tech designer and dad originally from Long Island.